← Seriously, When Did ‘Based On’ Turn Into ‘Based Off Of’? Last fall the hardworking staff noted – Exclusive! – that Donald Trump Is Our First Cubist Presidential Candidate (Because He’s on Every Side of Every Issue). 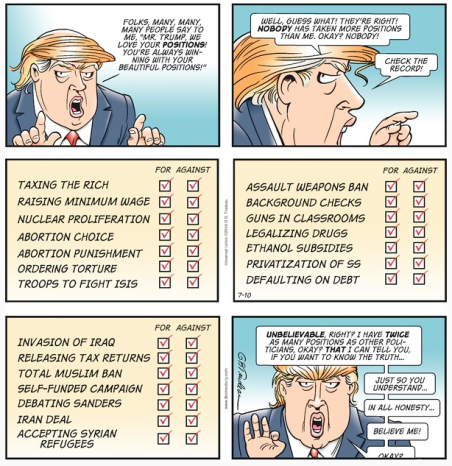 We even provided this handy clip ‘n’ save graphic, compliments of Garry Trudeau’s Doonesbury. Not surprisingly, Trump is just as fractured in the Oval Office. Exhibit Umpteen: This PolitiFact Flip-o-Meter. Donald Trump went into the White House with a mandate to break with tradition. In many ways, he’s embracing it. As he marks 100 days in office, Trump has adopted more establishment-friendly positions, as well as habits of his predecessor, than his campaign persona let on. He has changed his position on a dozen key promises and positions, our analysis found. All that flopping sort of makes Trump the Sea Bass in Chief, no? Gotta seem mighty fishy to the Trumpiacs eventually, don’t you think? This entry was posted in Uncategorized and tagged cubist presidential candidate, Donald Trump, Doonesbury, flip-flops, Garry Trudeau, Pablo Picasso, PolitiFact, Trumpiacs. Bookmark the permalink.